I thought I would try my hand at making a bear. Since I couldn't decide on what fabric to use, I used them all. I really enjoyed the process and the fabric possibilities are endless. I'm thinking of calling her Bella Bear. So much fun to name your creations. I found this vintage dress last week at a barn sale. Aren't the colors interesting? The seamstress knew her stuff because this is made really well, zipper and all. She was a wisp of a thing though, the dress is about a size 2. 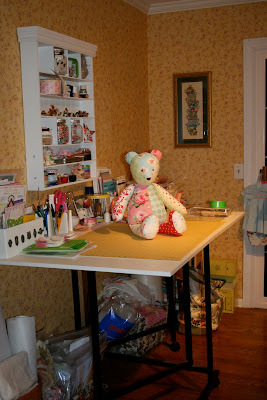 I thought I would show you the clean version of the sewing room. So much better than yesterday's picture. It's amazing how fast everything can go down hill when I'm not paying attention. Clean floors, stacked fabrics, yarn and thread put away. Now maybe when I need something I'll actually find it. I've been known to buy the same thing twice because I can't remember where I put it. I know, that's bad. Two quilts back from the quilter. Looks like I have some binding to do. I'm off to my parents house for lunch, they live about an hour from me. I hope you have a blessed Tuesday! I love your bella.And I like your room too. I love the fabrics you used for Bella. She's adorable. It's a dream for me to have a fabric cabinet like your some day. How fun! Your bear is adorable! I love all the different fabrics you used! I think the name Bella is quite fitting for her! My craft area is the same way! I'll clean it and as soon as I work on something I've got a mess going again! Your craft room looks lovely! I hope you have a wonderful lunch with your parents! Bella is just way too cute!!! Great fabrics. I love how you just go for it and make so many things. I am getting ready to start Jen's quilt and I am so nervous to cut the fabric. Does that ever go away? I love Bella too...too cute with the different fabrics you used! Oh, Oh, Oh, Oh, Oh!!!!!!!!!!!! Bella Bear!!! Do I even need to say more? Your talents are unceasing! Endless! Have fun at your Mom & Dad's. I love Bella Bear. What a cute name to go with a cute bear. 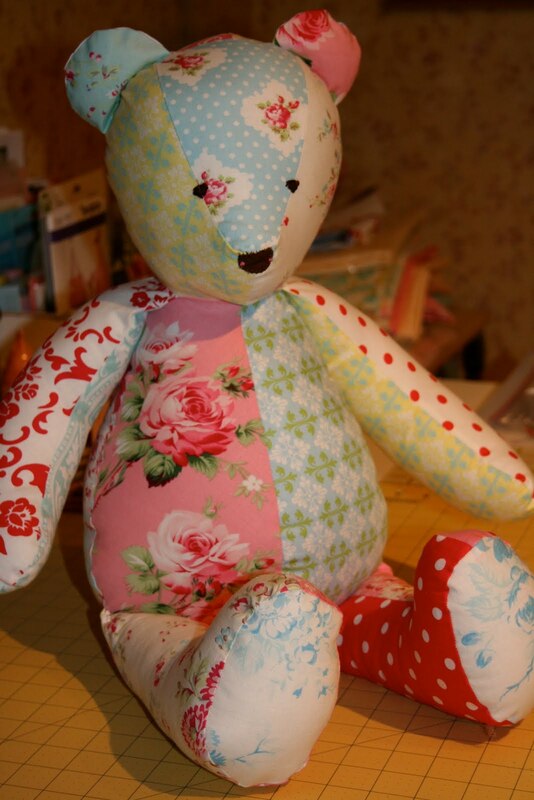 I used to make bears like that out of vintage chenille. I had forgotten that. 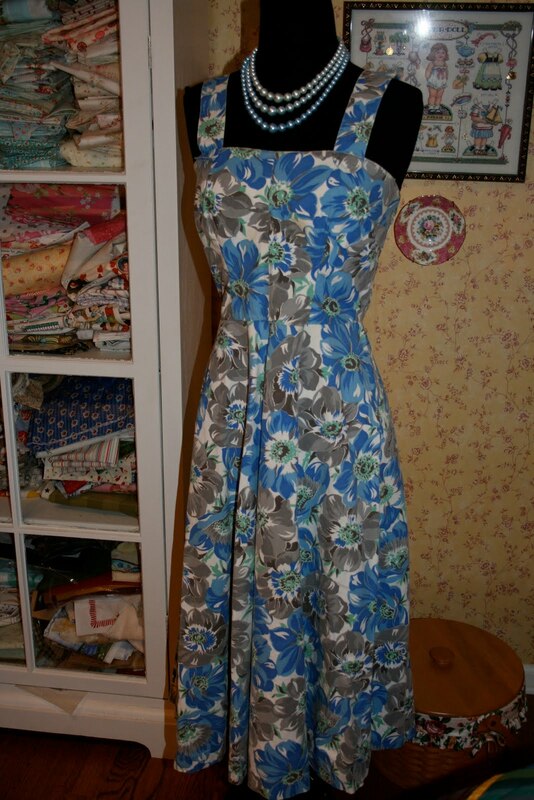 The dress looks so "at home" in your clean neat sewing room. I love the binding part of quilting. Guess it's the hand work. Oh, I love your Bella Bear...makes me want to make one! Bella is soooo sweet! What beautiful fabrics! I sure do love your work! Thank you for posting the Itty Bitty Nursery book. I have Itty Bitty Hats and just love it; I'll have to look for the nursery book. first of all, I love the bear...did you use a pattern that you had bought? I would love to try and make one.....I love how how you mixed the fabrics up.